Ms. Blank is a finance executive with over 30 years of financial and operational experience, primarily in financial services. From 2015 through 2016, she was Chief Financial Officer at ZAIS Group, LLC, an alternative asset manager. While at ZAIS, Ms. Blank also served as the Chief Financial Officer of its externally managed publicly traded residential mortgage REIT and its public holding company. 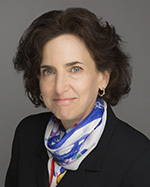 Prior to her role at ZAIS, she served as Chief Financial Officer and Executive Vice President at NFP Corp., a publicly traded insurance brokerage, from 2008 until 2013. From 2003 to 2008, Ms. Blank was Chief Financial Officer at Financial Guaranty Insurance Company, both before and subsequent to its sale by GE Capital to an investor group in late 2003. She currently serves as an Independent Director and member of the Audit Committee at American Enterprise Mutual Holding Company. Ms. Blank holds an MBA in Finance and a Master of International Affairs, both from Columbia University.